Let us design, supply & fit your brand new kitchen. At Moiety Kitchens, our aim is to turn your ideal dream kitchen from a simple thought or sketch into a reality. We will take you from the start of the process to your very first family meal in your brand new kitchen. 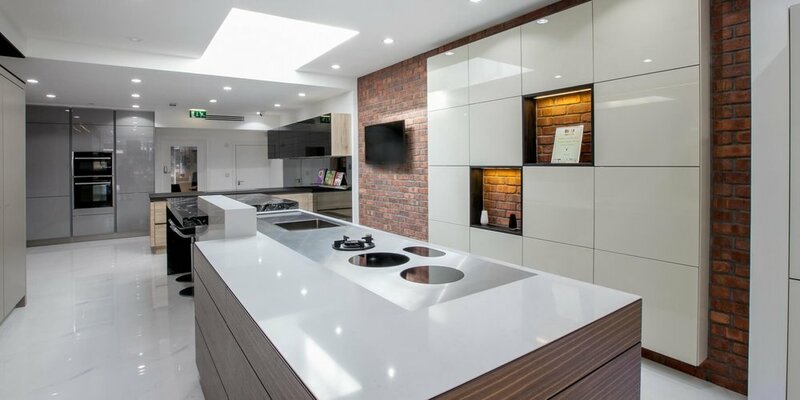 Based in North West London, we specialise in the design, supply and fitting of high quality German manufactured kitchens from Warendorf, Nobilia, next125 and Schuller. In recent years, the kitchen has once again become the "hub" of family life in a home. No longer just somewhere hidden away to prepare food, the kitchen is also a place to entertain, relax, play and even work, and with so many functions in mind, kitchen design has become even more complex. Our designers will ensure that every element of your kitchen is perfect. Everything will fit, everything will work and everything will be exactly how you dreamed it would be. Due to their quality, flexibility and reliability, we specialise in leading German kitchen manufacturers. We are also authorised suppliers of many of the leading kitchen appliance brands as well as numerous worktop suppliers. All this enables us to take care of every detail of your project. Whether you know exactly what you want or need someone to help translate your vision to reality, let Moiety Kitchens give you innovative and practical guidance to show you what can be done with your space. When it comes to luxury fitted kitchens, German brands have long been held in the highest regard for their unsurpassed attention to detail, quality manufacturing, reliability of hardware and availability of finishes and sizes. Moiety Kitchens are suppliers for a range of four German kitchen manufacturers and we offer an array of styles, designs, finishes and prices to suit any type of modern kitchen. When it comes to all round quality, nothing beats a built-in kitchen from Germany. When it comes to sophistication and quality, Warendorf is one of the very top German kitchen manufacturers. Their ethos is based around reliability, quality and longevity and they really do allow us to create any design of kitchen imaginable. To quote next125 themselves, their kitchens are "sustainably produced - to a surprisingly pleasant price". Another reliable and innovative manufacturer of German kitchens next125 do offer something unique and value for money. Schüller kitchens are one of the most established and biggest German kitchen manufacturers. Founded in 1965, Schuller continue to be one of our most popular built-in kitchen brands with a large range of size and configuration options. One of the largest kitchen manufacturers in the world, Nobilia produce stylish kitchens at a great price. All their kitchens are manufactured at one of two Nobilia factories in Germany and their range of finishes, colours and styles is vast. will talk to us about your kitchen? 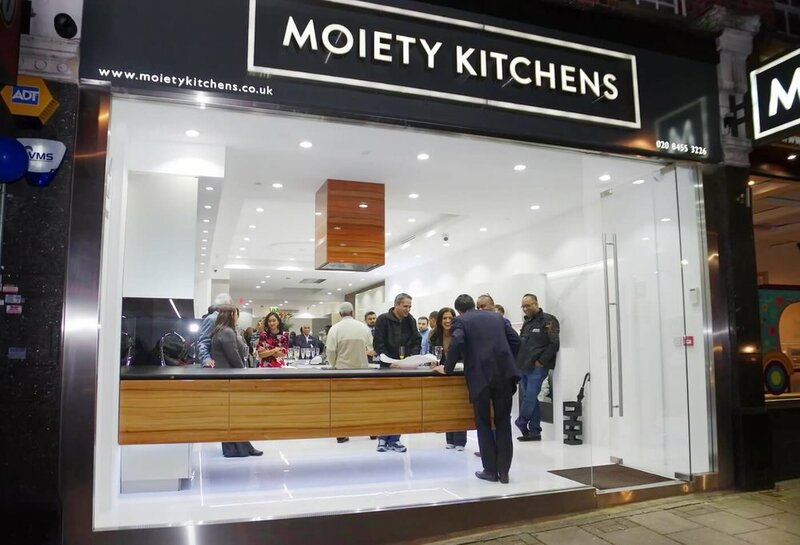 Open since 2014, Moiety Kitchens has one of the most innovative kitchen showrooms in the UK and, despite opening during a time of economic uncertainty, we have been truly amazed at the demand for our products. 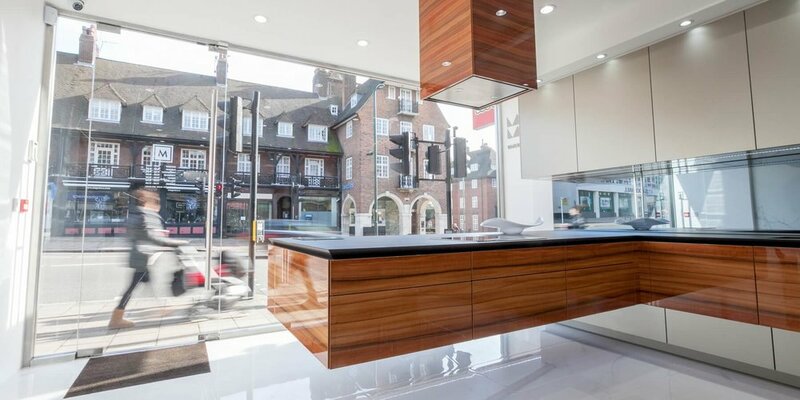 Our Finchley Road kitchen showroom includes five full size working kitchens on display, and our storefront window is dominated with our gravity defying floating peninsula kitchen. 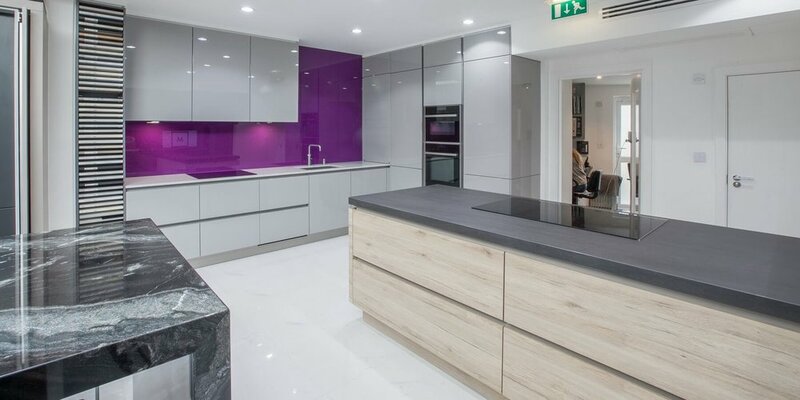 We specialise in supplying world renowned German made kitchens across London (and beyond) covering every conceivable luxury kitchen requirement and delivering quality, style and a breadth of product portfolio over a wide range of budgets. Of course, we also supply a wide range of kitchen appliances, worktops, sinks and taps too. So we are a totally one stop shop for your new kitchen. A qualified Mechanical Engineer, Manish is the driving force behind Moiety Kitchens. He has spent his whole working career in the kitchen industry and despite his tender age, he already has almost 10 years experience. His drive, enthusiasm and passion for everything "kitchen" always shines through when working with clients and he loves to innovate. 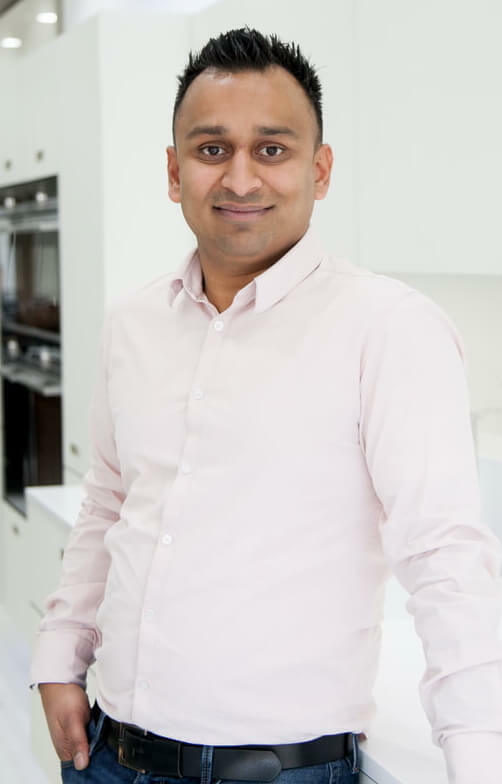 Dhiren is in charge of day to day operations and manages the kitchen installations from order to completion. He ensures the whole process runs smoothly. He is responsible coordinating the deliveries from suppliers to our warehouse before distribution to site during the installation of your kitchen. If any queries arise during or after the installation of your kitchen, then Dhiren is here to sort it out. Claudia is a kitchen designer with a Masters in Architecture and this adds a host of skills and understanding to the art of kitchen design. Originally from Milan, Italy, Claudia brings a distinct flair and style to the kitchens she creates for our customers. She is also an expert in utilising our AutoCAD and 3D visualisation software to create very detailed and realistic plans and renders of your new kitchen.